rian Luckner (b. 1959) is Director of Music and Organist at the Cathedral of Saint Joseph the Workman in La Crosse, Wisconsin, a position he has held since 1988. In addition to his full-time position at the cathedral, Dr. Luckner is Director of Music and Organist at the Shrine of Our Lady of Guadalupe in La Crosse, and is director of the La Crosse Diocesan Chorale. He also serves as an adjunct faculty member at Viterbo University. He holds the Doctor of Musical Arts degree and the Master of Music degree from the College-Conservatory of Music at the University of Cincinnati, and the Bachelor of Music degree from the Oberlin College Conservatory of Music. He participated in the "Accelerated Bachelor of Music Program for High School Students" at the Cleveland Institute of Music. Luckner's organ teachers include Roberta Gary, Garth Peacock, Margaret Irwin-Brandon, and Philip Hodel; he studied harpsichord with William Porter and Lisa Crawford; choral conducting studies were with Daniel Moe. He has performed in master classes under David Craighead, Luigi Ferdinando Tagliavini and Louis Robilliard. 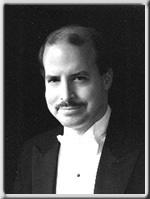 Dr. Luckner served as head of the Conference of Roman Catholic Cathedral Musicians (United States and Canada) from 1997 to 2002. Prior to his appointment in La Crosse, he was the Assistant in Liturgical Music at the Basilica of the National Shrine of the Immaculate Conception in Washington, DC. Earlier church positions include serving as organist and music director at the Church of the Guardian Angels (Roman Catholic) and at Holy Trinity Episcopal Church, both in Cincinnati, and at Christ Episcopal Church in Oberlin, Ohio. He previously held assistant organist positions at Saint John the Baptist Catholic Church in Canton, Ohio, and at Saint Joseph Catholic Church in Massillon, Ohio. His compositions have been commissioned by the Cathedral of Saint Matthew in Washington DC, by the Cathedral of Saint Louis in Saint Louis, Missouri, and by Viterbo University in La Crosse. One of his works was performed at the Papal Mass of Benedict XVI at Nationals Park Stadium in Washington DC on April 17, 2008. Awards include election to the national honorary music society Pi Kappa Lambda, the Selby Houston Memorial Award in Organ and Theory at Oberlin, and the University of Cincinnati Organ Playing Competition: Strader Awards (first place in 1981, second place in 1983). He is listed in Who's Who in America (2006) and Who's Who in the World (2007). Luckner has twice taken the Cathedral Gallery Singers to Europe. In Italy, they sang in Rome for the principal Sunday Mass at Saint Peter's Basilica, for a liturgy at the Basilica of Saint John Lateran, and performed in concert at the Church of Saint Ignatius. At Assisi, the choir sang for a liturgy at the Basilica of Saint Francis. In Paris, they performed in concert at the Cathedral of Notre Dame and at the Basilica of Saint Clothilde, and sang for a Sunday Mass at Saint Clothilde. Brian and his wife Danielle have two young sons, George and Harry.